The sponsor of controversial Navajo Nation legislation to approve Grand Canyon Escalade pulled it from the agenda in the final hours before it was to be voted on by the Navajo Nation Council this week. The bill would have approved an agreement for constructing Grand Canyon Escalade, a 420-acre resort on the Grand Canyon’s eastern rim, with a 1.6-mile gondola designed to carry 10,000 visitors a day down to the bottom of the Grand Canyon at the confluence of the Little Colorado and Colorado rivers. After almost a year of political maneuvering, the bill is dead, at least for now. Council Delegate Ben Bennett introduced the legislation to the Navajo Nation Council in August, 2016, and it has been losing committee votes ever since. Eleven months later, the fourth and final committee to review it before it could be voted on by the full council — the Naabik’iyati’ Committee — rejected the Escalade bill by a vote of 14 to two. Nonetheless, according to legislative rules, it would have moved on to a final vote by the entire 24-member Council during this week’s summer session. But Bennett asked that the Escalade bill be removed from the agenda of the Council’s summer session and had it placed on the agenda for the Council’s fall session, which meets during the third week of October. Bennett said that he wants to create a negotiating team of Council delegates to sit down with the Escalade developers to make some changes to the proposed master lease agreement. The problematic agreement would require the Navajo Nation to appropriate $65 million for the development of off-site infrastructure for the Escalade project and include a covenant not to compete, barring vendors, from fry bread stands to jewelry sellers, from 40,000 acres of Navajo land surrounding the project, a waiver of Navajo laws, and withdraw 420 acres of land for the development in the Bodaway/Gap Chapter, which would prevent it from being used for grazing or other activities. For six long years, Save the Confluence — Navajo residents and grazing permit holders of the Bodaway/Gap Chapter — have been opposing the proposed Escalade development. According to Navajo law, unanimous consent must be granted by local land users before the land can be withdrawn for development. Instead, Scottsdale developer Rial Lamar Whitmer and former Navajo Nation President Albert Hale decided to bypass the law and negotiate a deal behind closed doors with the administration of then Navajo President Ben Shelly. That master agreement, which Council Delegate Bennett now proposes to revise prior to the fall session, would require new approvals by the current administration of President Russell Begaye. And, according to legislative attorneys, it would require new legislation to authorize negotiations and to approve a new master agreement. Save the Confluence members continue to stand in strong opposition to the development proposal. During recent months they have secured resolutions against Escalade from the five government agencies that represent all 110 chapters of the Navajo Nation, and the four chapters that Bennett represents have voted overwhelmingly against the project. After learning that Escalade would not get a final up-or-down vote during the summer session of the Navajo Nation Council, Save the Confluence members gathered outside a local restaurant to reflect upon what they had accomplished thus far. Save the Confluence consultant Larry Foster explains how the sponsor of Escalade legislation pulled the bill, rather than have it voted down in the summer session of the Navajo Nation Council. Their many years of community organizing had soundly defeated an illegal and unethical agreement that had been forced on their community by political leaders who no longer hold office. They remain united and vigilant to do whatever it takes to defeat whatever bill might reappear this fall. 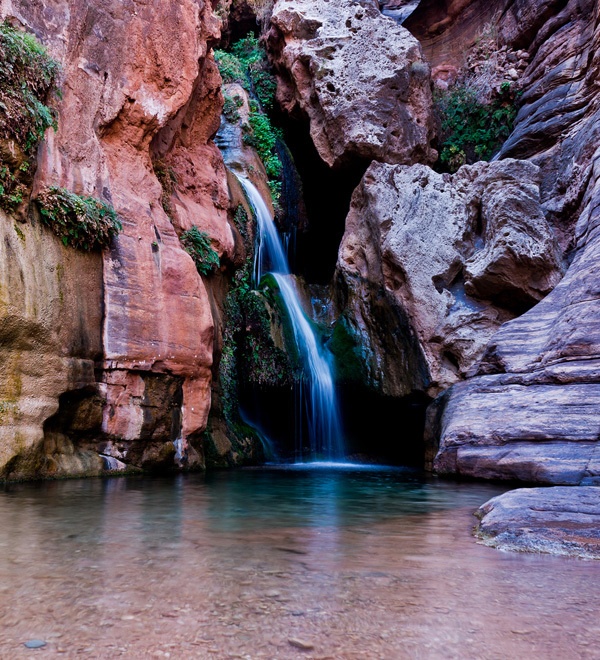 The facts about the Grand Canyon Centennial Protection Act and the temporary mining ban it would make permanent. Never miss a post. Grand Canyon news in your inbox.